For those of you wanting a small portable miter saw with a big cutting capacity, Makita has introduced their new Model LS0815F 8-1/2-inch Dual-Bevel Sliding Compound Miter Saw. Other than their 18V Miter Saw, it has been more than a few years since Makita has come out with a compact slider, and I am sure it will be a welcomed addition. At 31.1 pounds, the LS0815F is only a couple of pounds heavier than their much older 7-1/2-inch SCMS, but the bigger blade brings the benefits of a larger cutting capacity. At 90° it can cut up to 2-9/16" x 12", and up to 2-9/16" x 8-1/2" at 45°. The saw miters 0° to 50° left and 0 to 60° right, with positive stops at 0°, 15°, 22.5°, 31.6°, 45°, and 50°, plus 60° (right). It can bevel 0° to 48° (left) and 0° to 5° (right) with positive stops at 0° and 45° (left). The LS0815F is powered by a direct drive 10.5 AMP motor at up to 5,000 RPM’s that features a soft start as well as an electric break. Makita says their direct drive is an advantage because there are no belts to worry about, but I have never found belts to be a problem. 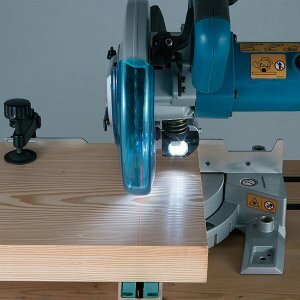 One of the feature I most like about the new 8-1/2-inch miter saw is the built in LED work-light. When working at the miter saw there never seems to be enough light, so any extra light should be nice. I would, however, like to see lights on both sides of the blade.